I was up bright and early, despite my late return to the hostel the night before. It was Pompeii Day! I remember reading about Pompeii, the bustling port and trading city that was buried after the eruption of Mt Vesuvius in 79AD. 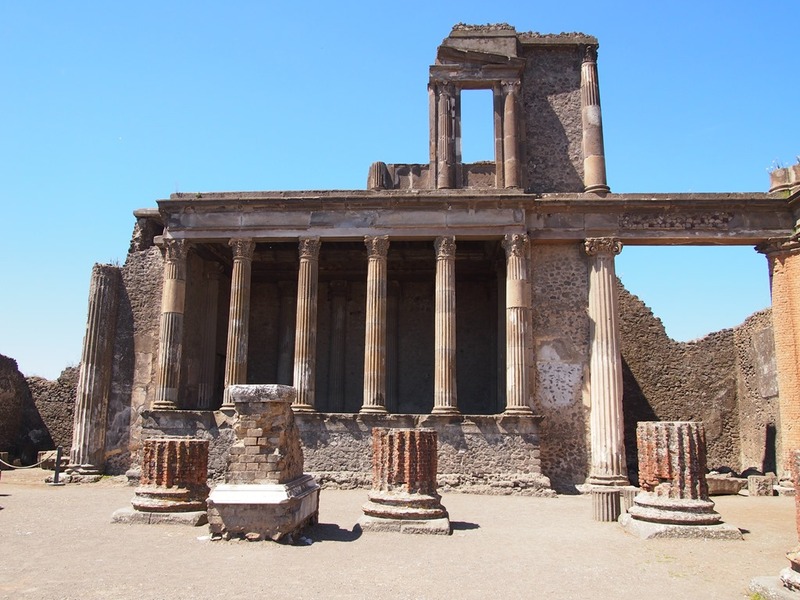 First excavated in the late 1700s, Pompeii has been an important archaeological site for centuries. In its day it was prosperous – the Malibu or Palm Springs of the Roman era – with sprawling villas, ornate decorative elements and all of the trappings of prosperity. Pompeii is easily reached by Naples using the Circumvesuviana, a local rail system. Affordably priced, a return ticket from Naples to Pompeii Scava cost only €4.20… but not all Circumvesuviana trains stop at Pompeii. It was easy to tell where the tourists were going and the train conveniently stops right outside one of the main entrances to the site. Walking towards the gate, where admission is a fairly reasonable €11, are a number of souvenir sellers, snack bar operators and gelato purveyors. 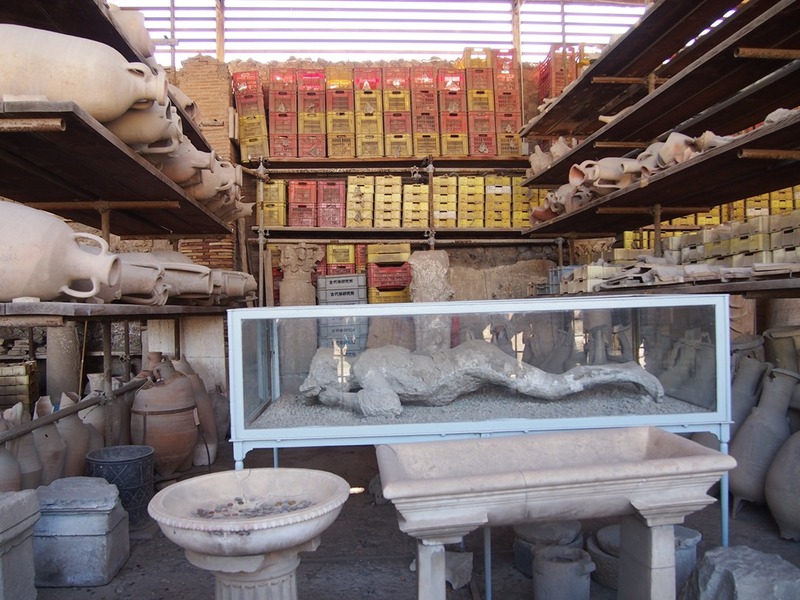 I later found out that the construction of a cafeteria on site led to a major controversy – first during the construction, then after it opened – and some of the souvenir sellers found a provision which stopped the sale of souvenirs directly within the walls of Pompeii. The only trinkets that can be purchased are reproductions of mosaics and frescos, painted by officially licensed and approved “copyists”. Bathrooms were free on the site, which was nice (once again, no toilet seats), and with only two approved souvenir stands it was easy to walk around and explore without feeling constantly pressured to buy things. The area around the main entrance and the theatres was quite busy with lots of tour groups and tourists, but as you ventured deeper into the site it was easy to lose the crowds. I can’t imagine coming to Pompeii in the heat and bustle of summer and, to be honest, I wouldn’t really want to. I think a lot of visitors miss the sites that are located a bit further out on the map, likely tired from the uneven streets and the relentless sun. There are some areas on the site where the sidewalks have been fixed up and rebuilt, which was always a joy for my tired feet. 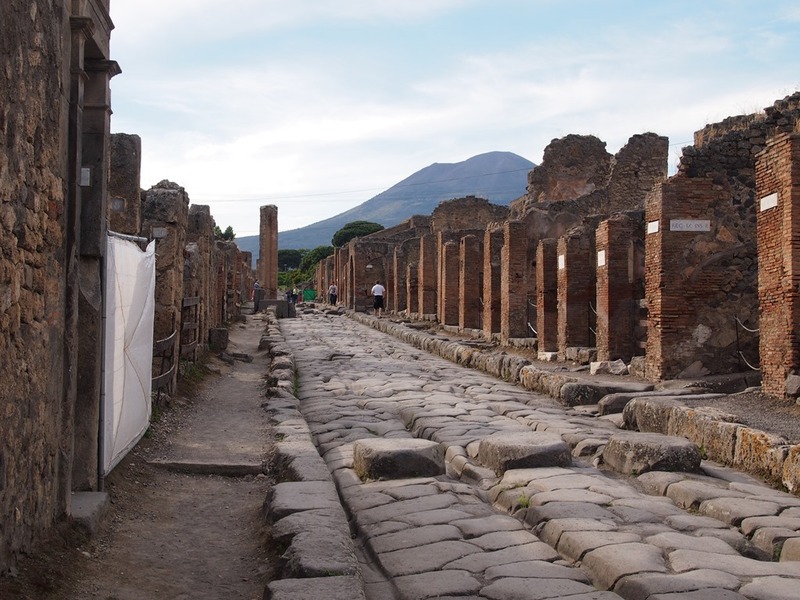 The original streets of Pompeii are made of large, smoothly worn rocks of varying heights. This means that walking around can be a significant challenge and sturdy shoes are a must. 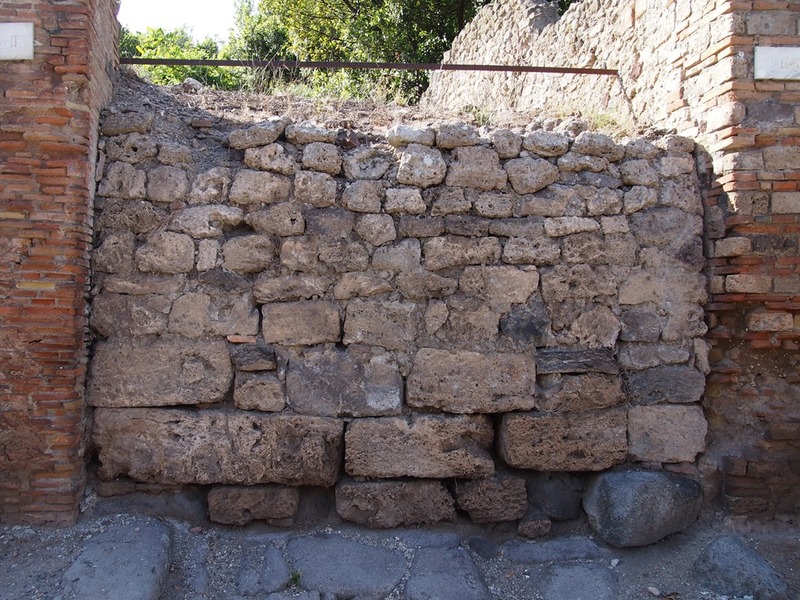 It’s interesting to see the ingenuity employed in the Roman road design – many intersections had large rocks so that one could cross the road (in the rain, for example) without worrying about whatever was sliding down the road. check out the elevated rocks. clever! I kept meeting up with an American man during my early wanderings and we finally engaged in conversation during a visit to one of the open villas. The American, Dean, was a bit of an expert in Roman history and this was his eighth visit to Pompeii. He invited me to spend the day with him, which was fortunate, as it was like having my own personal tour guide. 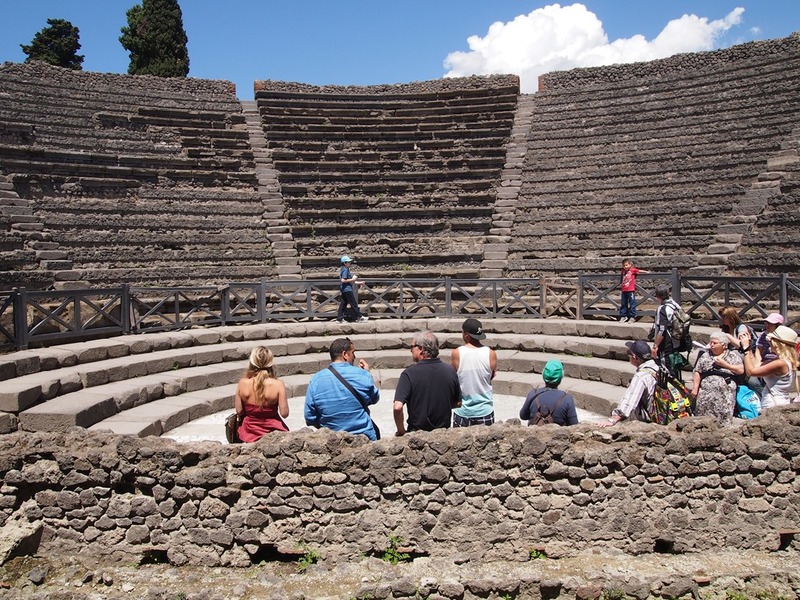 He first visited Pompeii over 20 years ago and has noted a significant changes in the site. There is much less graffiti on the walls, which is a positive development – I really don’t understand why people feel the need to scratch their names into ancient monuments – yet the site itself has visibly deteriorated. 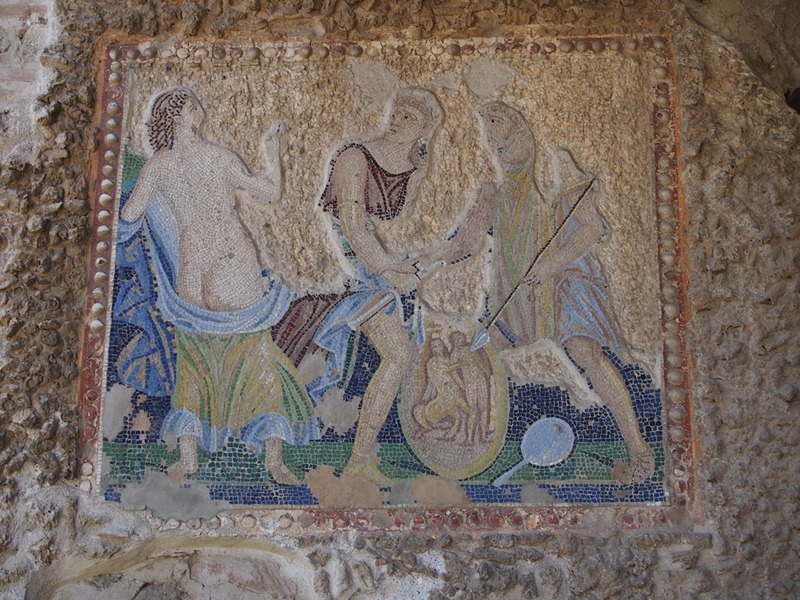 Frescoes and mosaics have faded, walls are damaged and access has been restricted. Gates and security cameras have appeared where people could once freely wander… not necessarily the best way to spend money allocated for the preservation of the site. 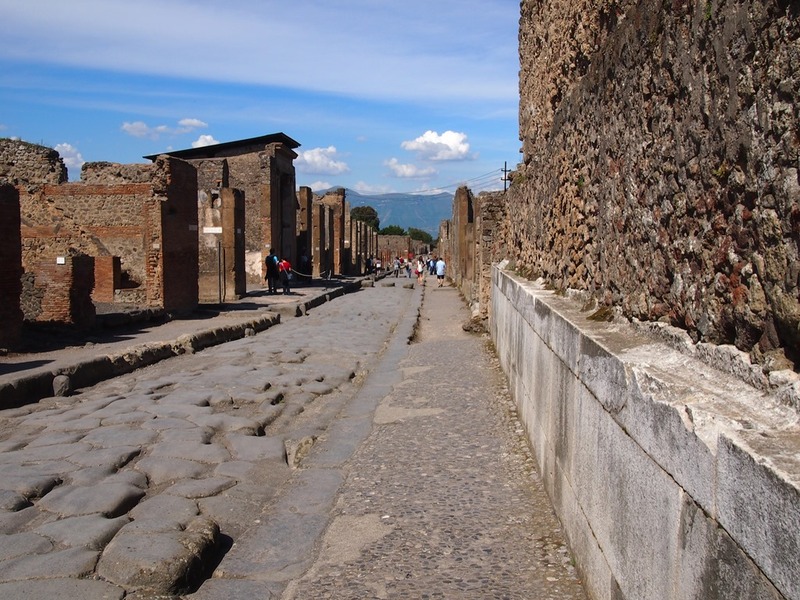 streetscape in Pompeii… look at those rocks! There was apparently a debate between interested parties with respect to the preservation of the site. Some believed that it should be left as is, open to the elements and allowed to decay or deteriorate as it stood. Others – and this is the group that appeared to win out – believed the site should be preserved. Roofs have been added over many of the buildings and shades added over painted walls that could not be easily roofed. 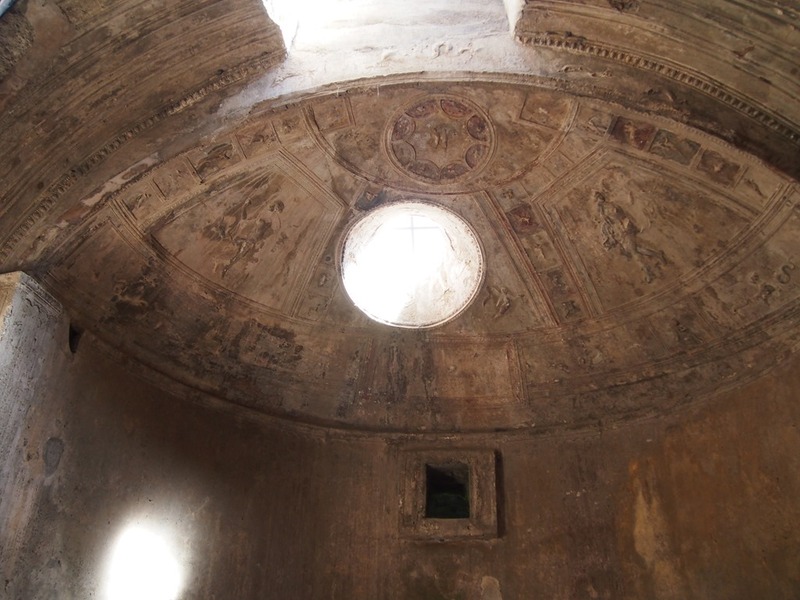 Many of the best preserved examples of Pompeii’s art are in the Naples Archaeological Museum and although the excavations in the 1700s were rudimentary, at best, it’s fortunate that they were able to remove many of the works. I was really surprised to see how they treated recovered artifacts. I would have expected things to be carefully numbered, cleaned and stored in a climate controlled warehouse, but instead they were left on site. The storage area had a roof and three walls, but the front was open to the elements with only a gate to protect the items from the throngs of tourists. Some artifacts sit on shelves, like the vases in the picture above – with only a rock to keep them from rolling off. Other pieces are stacked in milk crates and storage containers, as you see in the back of the photo. 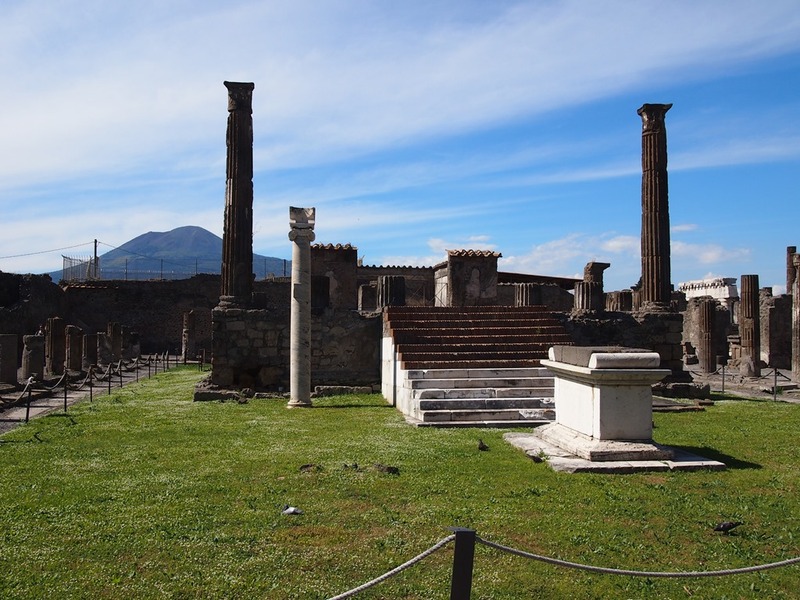 It should also be noted that this is an earthquake prone zone, and, as the history of the site clearly shows, subject to the volcanic whims of Mount Vesuvius which last erupted in 1944. The plaster cast that you see in the forefront of the photo was created by pouring plaster into a recess (or void) left between the ash layers. This allows scientists to see the exact position of the body when the victim died and the technique of pouring plaster into the void was adopted in the 1860’s. 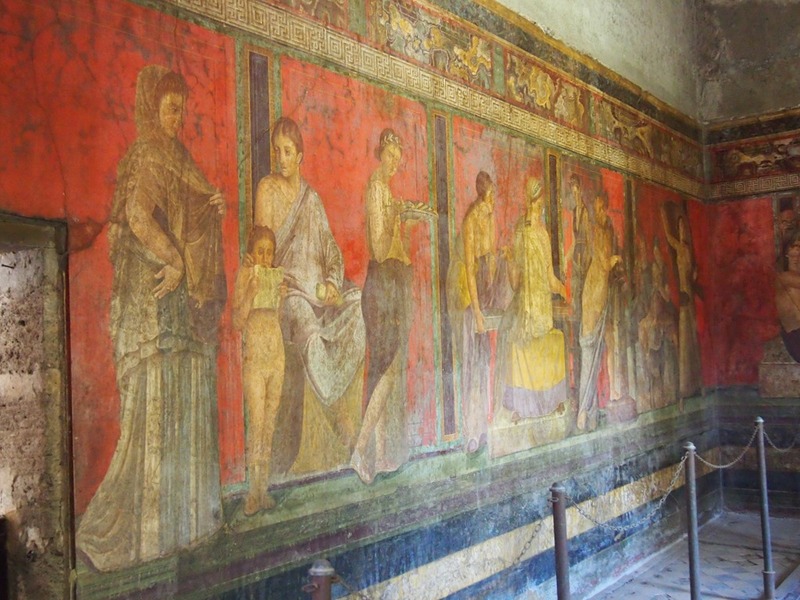 The estimated cost of work necessary for the preservation of Pompeii is estimated at US $335 million. There was scaffolding up on many of the walls, due to the threat of collapse from erosion. I learned from Dean that more of the city was excavated and then covered up again and we actually saw an example of a road that had been completely filled in by rocks. Vegetation grows on top of the ruins which further weakens the remaining walls. excavated and then refilled… maybe this is part of the erosion problem? 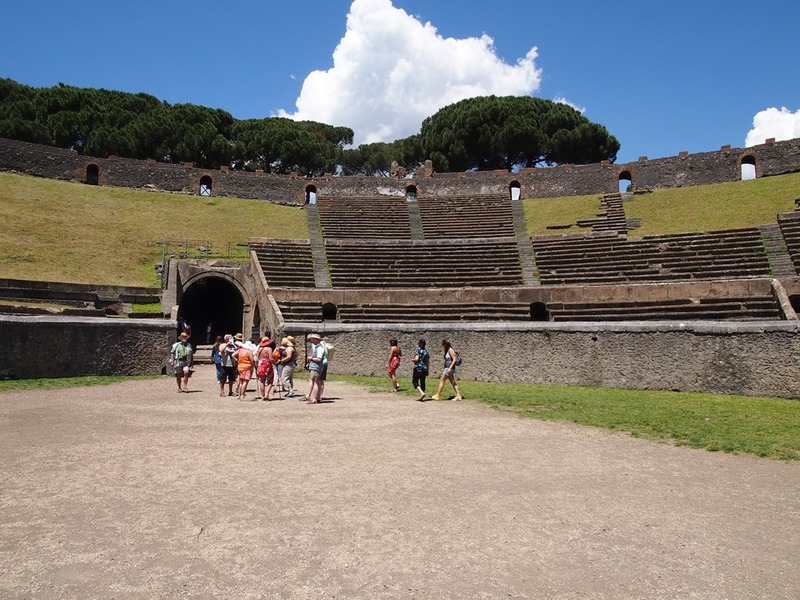 We covered a huge amount of ground, wandering from the theatre complex to Pompeii’s stadium (basically a small Colosseum) to the Villa of Mysteries and back again. The site is enormous – it was a city of 20,000 people during its heyday – with random streets and buildings blocked off. It was interesting to tour the site with Dean because of the perspective he offered. There were buildings opened that he had never been inside before, an interesting reason to keep returning. One of the buildings appeared to be open for a private tour as a Pompeii workman pointed up a deserted looking street and told us to go in. 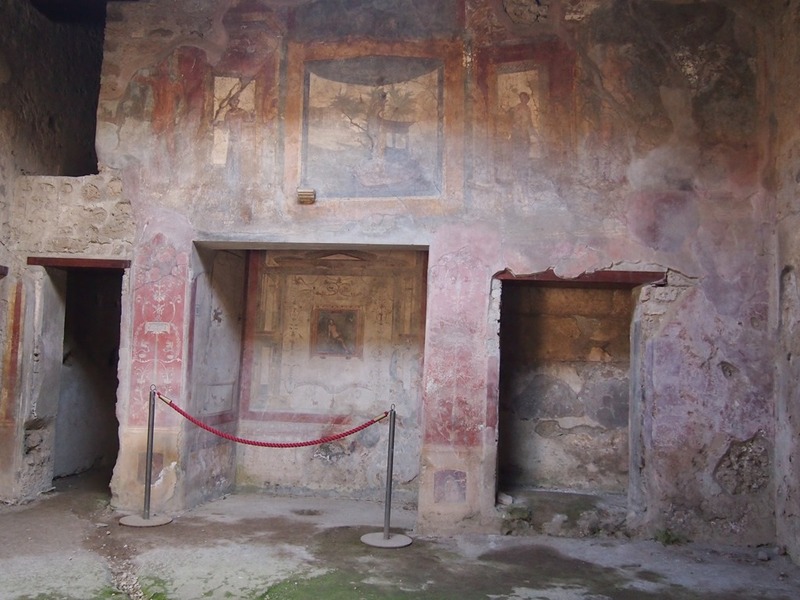 He followed us in, eagerly sharing the suspected history of the site and telling the story of the frescoes on the walls. One of the rooms, he told us, was suspected to be the room of children due to the yellow paint and the pictures of young looking Gods on the walls. 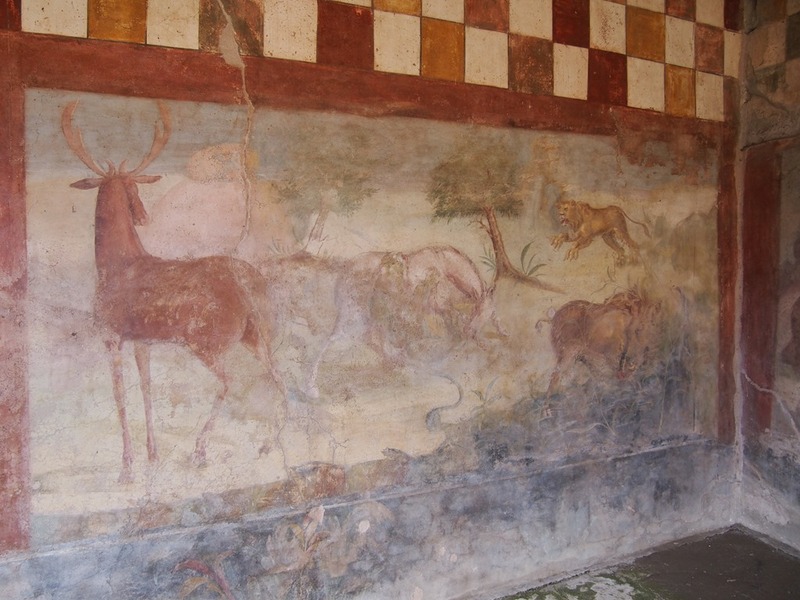 I was most particularly intrigued by the paintings around the courtyard, decorated with animals – deer, lions, bears, exotic cats… we asked if they had been restored and our unofficial site guide seemed to indicate that they hadn’t been. One of the next buildings we visited was another that had never been opened – and we had walked by the site earlier in the day, peering through the locked gates. There also seemed to be a higher than normal security presence… and by this, I mean that there was a security presence. One thing I had noticed at Pompeii is that they didn’t seem to be a very large employer as I went most of the day without spotting any site employees. Italian police were there, pistols strapped to their waist. Some men in suits, standing around and looking official with sunglasses just above their eyes and then some people in plain clothes who also seemed to be security. Hmm… I assumed that if it was someone truly important that they would have blocked off the site entirely, but we were allowed to enter without question or challenge. It was a U.S. Congressional Delegation, apparently on their way home from Afghanistan. I won’t say much more about it than this, but I do think some of the members of the delegation could have behaved with more respect towards the guide and the site. I don’t know what the official name of the site was and Dean suspected it may have been a bath house based on the details, but it quickly filled with tourists and they refrained from kicking everyone out after the delegation left. It was at this time that I noticed a familiar face in the crowd, peering at the ruins and examining the art just like everyone else. No – it couldn’t be – Jimmy Cooper, from The OC? The actor’s real name, Tate Donovan, leapt to the forefront of my mind and we made eye contact – he knew I recognized him, and it’s not like he was wearing any celebrity disguises – but we didn’t speak until he and his friends, a lovely couple on their honeymoon that he had run into, were trying to figure out where they were on the map. Dean wasn’t really up on pop culture and after we said our goodbyes to Tate and his friends I tried to explain my affinity for The OC and described how I was the perfect demographic for the show when it was on. Seeing as how no one else seemed to recognize him, either on the site or on the commute back to Naples, I suspect that The OC wasn’t a big deal in Italy. I have always wanted to go to Pompeii and I’m glad I did, but the site wasn’t quite what I imagined in my mind. It was both more and less than what I expected. More, because the site has a much larger scale than I expected – the maps do not do it justice; and less because of the state of preservation with respect to the site itself. I’m glad to see that the authorities are moving in the right direction, adding roofs and trying to protect what exists from the elements, but Dean commented on differences he’s spotted in the past six months (he last visited in November) which makes me think that the work really isn’t progressing fast enough. I plan to visit Ostia Antica in Rome, a city which used to be at the mouth of the Tiber River, and I wish I had time to visit Herculaneum, another town which was buried by Mount Vesuvius (although, it could be a city as they aren’t sure just how far the ruins extend). I will have to add it to my next Italian itinerary!